You can either drag your feet through life or find ways to celebrate it. GET EXCITED! I can offer a solution to just about any fitness need you have. I have certifications in corrective exercise, strength training and nutrition and I'm available for in home personal training or in a private modern gym so your training is customizable to fit YOUR LIFE. I love incorporating boxing and VIPR training into my clients workouts and finding new ways to make exercises more challenging. Contact me today for a free session! A grumpy workout is still a workout! I've been with Jessica close to 5 months now and couldn't be happier! She's gotten to further than my personal goals in record time. Jessica has been working with me for about a month. She is motivating, knowledgable and somehow able to even get an overweight, unmotivated man to get excited about getting in shape. In the first 3 weeks of training, she was able to help me lose 5 pounds and take an inch of my waist. Now 5lbs might not sound like much, but you have to consider that I was also gaining muscle mass so actual fat loss was probably closer to 8-9lbs. Not withstanding an old, untreated shoulder injury that has sidelined me for the last week, I am looking forward to the next session. In addition to her professinalism, Jessica offers a wide range of locations to workout, from your own home or apartment gym to a long list of boutique gyms where you can get the work done without the big box gym social scene. I'm enjoying getting fit for the first time, in a long time. The training is both thoughtful and tough. I met Jessica through a referral from a friend. I was a bit hesitant at first, I've worked with 2 other trainers before her and had seen some results, but wasn't really what I was looking for. I spoke with her beforehand on what I was doing and what I wanted out of a trainer. After a few emails I took a plunge to see what she could do. To say I was impressed would be an understatement. Our first day she had me doing simple movements just to see how my body moved and was taking notes the entire time. From there she built me a baseline for what I was good at, where I needed improvement, and the best course of action to get me where I wanted to be. She was more than just a meatbag trainer out to make a quick buck, she was there to push me and get me the results I wanted. I thought I was in good shape when I walked in the door, but nobody else can make a 5 pound dumbbell feel so heavy. She's extremely knowledgeable not just on how to lose weight and build muscle, but also in eating habits, body physiology, and the mechanics behind what you're doing. For someone like me who asks a ton of questions, she was exactly what I was looking for. Jessica is the best trainer I could ever ask for. I initially started training to get ready for my wedding. 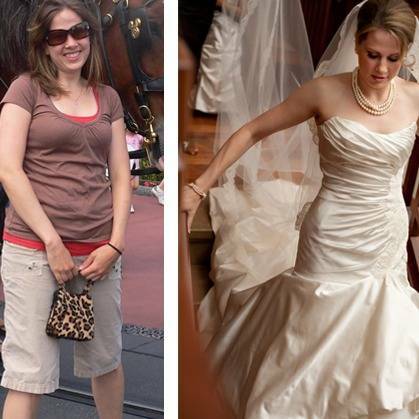 I lost 10% body fat in 10 months... for me that equated to going from a size 10 to a 0 in wedding dress sizes! Even now that the wedding is over, I train with Jessica and know that she has my goals and personal interests in mind during every single workout. I highly recommend Boost! Fitness for anyone who wants or needs a trainer. Seeing Jessica has been a way better use of my money than going to a corporate gym! Jessica is incredible. Before meeting with her, I had never before worked with a trainer. I was nervous about what to expect, a little embarrassed about how out of shape I was, and also a little skeptical about the process on the whole. How different could it be from just working out on my own? As it turns out the difference is huge. I've only been working with her for a few months but I've already lost almost 20 lbs! She keeps me motivated, but beyond that she has earned both my respect and friendship. She picks up on really slight movements in my body to keep my workouts more dynamic and tailor made. She also helps me with nutrition choices, even going so far as helping me plan my meals for special occasions or dinners out. If you are looking to get in shape and are willing to put the work in, I highly recommend working with her, you'll have fun and see results! I had never worked with a trainer prior to meeting Jessica. So I didn't know what to expect. From our first conversation, I knew that I needed to work with her. She challenged me. She told me to set goals and make a commitment. She worked with me in the gym and in teaching me how to make better food selections. The results speak for themselves. I am back to both the shape and weight I was in during college. I have also successfully completed 4 Tough Mudders and will tackle my 5th in a couple of months.